Curry leaves have a unique flavour and aroma, and they are included in Indian dishes to enhance the flavour of foods. They are native to subtropical and tropical regions of India. Apart from its usage to enhance the flavour of foods, curry leaves are also use in Ayurvedic medicines. Curry leaves are also rich in vitamin C, vitamin B, vitamin A, iron, phosphorus, carbohydrate and fiber. They also possess antioxidant, antimicrobial, anti-diabetic, and anti-carcinogenic properties. They are also effective in fighting against liver damage. Take a look at Curry leaves health benefits that have been proven by various studies. According to various studies, they had proven that Curry leaves have anti-diarrheal properties, which is as a result of the presence of carbazole alkaloids. The researches proved that diarrhoea induced by castor oil was significantly controlled by Curry leaves extract. The carbazole alkaloids found in Curry leaves also have antioxidative properties, which eliminates the cell-damaging free radicals in your system. In addition, the compound also have anti-inflammatory, antimicrobial, and anti-cancer properties. 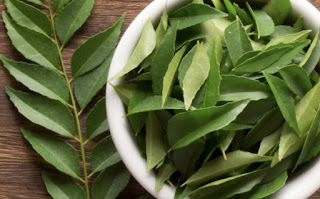 Curry leaves also known as kadipatta, is also used in protecting hair from premature graying. They also add strength to the hair and treat any damages that are been caused to it. Curry leaves is also an effective remedy for dandruff and hair fall. With this leaves, you can simply say good bye to your hair problems and this can be achieved by applying the Curry leaves Curry leaves on your hair or simply by eating the leaves. You can crush a few curry leaves to make a paste, then gently apply the paste on your scalp. After about 30 minutes, wash off the paste with clean water. Maintain this practice once every week and see the positive outcome of it. Various studies have also proven that Curry leaves have the ability to lower the levels of cholesterol in your blood by preventing cholesterol oxidation by free radicals. This in turn, aids an increase in HDL (or the good cholesterol). With the study conducted in rats, it proves that Curry leaves does accelerate the process of healing. It was discovered that topical application of curry leaf extract can help heal any surface wound. It can also be used to treat itchy skin, boils or minor burns. Now you are opportune to see some health benefits of curry leaves, you can go ahead and add more of it your food to enhance your health. Share this message with your friends to show that you care.